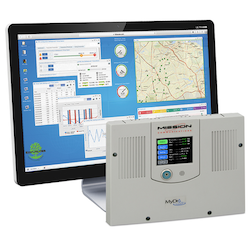 The MyDro series of remote terminal units (RTUs) augment legacy unit functionality with the addition of enhanced electronics and an onboard, interactive display screen. These RTUs support 16 digital inputs, six analog inputs, two pulse inputs and two analog outputs simultaneously. Over-the-air firmware upgrades are available, and the LCD touch screen supports local configurability while displaying current RTU statuses.